Time marches on at Hermès which modernises its Dressage watch. Created by Henri d'Origny in 2003, the aesthetic is more contemporary than ever while remaining true to its original temperament. While the case retains its dimensions, a larger opening for the black or opaline silver dial emphasises its roundness and the openworked dauphine hands. The bevelled tonneau shape accentuates the curve and the unique character of this timepiece, which lends itself to two versions in pink gold and eight in steel. They are all equipped with the H1837 Manufacture calibre with small seconds or date at 6 o'clock. The leather is selected in accordance with the noble saddle-making traditions of Hermès for straps which are crafted in the company's ateliers in Switzerland. 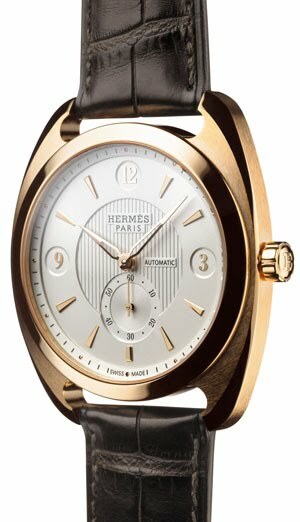 The pink gold version with a black dial and alligator strap is proposed as a 175-piece limited series, in reference to the 175-year history of Hermès.